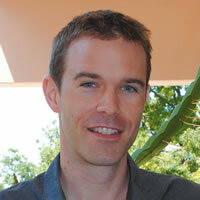 Claremont, Calif. (February 4, 2014) — Pitzer College Assistant Professor of Environmental Science Colin Robins co-authored a paper about experimental soil dating techniques that could help scientists better understand climate change and how soils record temperature over time. “Testing the applicability of vacuum-encapsulated 40Ar/39Ar geochronology to pedogenic palygorskite and sepiolite” appears in the April 2014 edition of Quaternary Geochronology. Robins teaches chemistry at Pitzer’s W.M. Keck Science Department. Robins and his co-authors applied a well-established, commonly used isotopic dating technique to desert soil-landforms using target minerals that no one had previously attempted to date. They studied soils from existing landscapes as well as paleosols, or “fossil” soils, from the stratigraphic record. It is notoriously difficult to reliably date these calcrete or caliche (carbonate-cemented) soils. This paper is another step in the ongoing efforts to create new methods that accurately quantify rates of landscape evolution in arid environments, which will improve scientists’ understanding of how climate change is recorded by both soil mineralogy and profile morphology. Robins studies how soils, sediments and landforms record surface, climate and ecosystem histories. His current research focuses on developing quantitative, isotopic measures of arid soil minerals and applying soil science to challenges in species conservation and land management. The article was co-authored by Brenda J. Buck, Terry L. Spell, Deborah Soukup and Spencer Steinberg. Quaternary Geochronology is an international journal devoted to the publication of peer-reviewed articles on all aspects of dating methods applicable to the Quaternary Period—the last 2.6 million years of Earth history.